"This is nectar of the gods. A perfect sticky satisfying hop bomb"
It was Friday and I was looking to stock up for the weekend. My local beer store just received a palate of Alpine beers that had come in the day before. Nelson and Pure Hoppiness quickly found its way into my cart, (as well as a few Plinys for good measure). 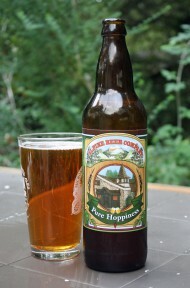 Alpine Brewing Co.’s beers have always been top notch. Their Exponential Hoppiness is right up there in my top 10 doubles. I also had heard great things about their Bad Boy Imperial but have yet had the chance to taste. The color is a beautiful sunset orange, with a thin head and nice lacing. Smell is sweet malt, light grapefruit, pine and lemon. The smell gets better and more prominent in the tropical as it warms. The taste of sweet malt grabs me up front. The tropical fruit notes come in the middle and ends with a bitter hop finish. This is nectar of the gods. A perfect sticky satisfying hop bomb that I just love to savor. The carbonation is medium and really carries the flavor and the 8% from start to finish. The alcohol sneaks up on you pretty quick. Pure Hoppiness, you did live up to your name and that much more. I must admit, 3 of you in one night may be….